Protect your heating systems with these sturdy and reliable Relief Valves manufactured by Bell & Gossett and Watts. What is a Relief Valve? 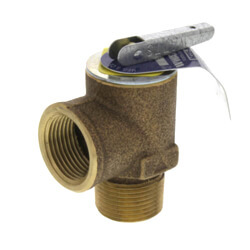 A temperature and pressure (T & P) relief valve is the primary "back-up" safety device that prevents water in a pressurized hot water heater from overheating. A T & P relief valve is a two-in-one safety device, which responds both to excessive temperature and to excessive pressure in a water heater. If a system exceeds its temperature/pressure limit, a water heater or pipe will burst, making the proper installation of a T&P relief valve essential. A T & P valve responds to excessive temperature by expansion of the thermostat. This lifts the disc off its seat and discharges overheated water. As overheated water exits the tank it is replaced by cool water. This process regulates the water temperature in a hot water heater. 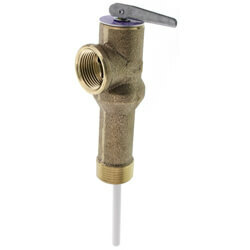 Typically, when a valve is relieving water in volume, it is due to excessive temperature. The valve also responds to excessive pressure by discharging water to prevent further pressure increase. When water is heated in a closed system, it expands and causes an increase in pressure. This is called thermal expansion. When the system is opened, pressure will return to normal, and the relief valve will stop dripping. When a backflow prevention device or check valve is installed on the water service entering a building, a closed system is created. When water is heated, it expands. Because the water has nowhere to go in a closed system, a potentially dangerous situation is created, and a T&P relief valve must be installed. If a T & P valve is dripping, rather than relieving in volume, the valve is prevented from closing tightly. A dripping valve usually indicates either thermal expansion or debris on the seat. T & P relief valves may be constructed of bronze or cast iron. To select the proper T & P relief valve a system's capacity, pressure, and temperature requirements must be determined. We offer a wide selection of Bell & Gossett, Watts, Zurn - Wilkins, McDonnell & Miller, and Cash Acme relief valves to protect your heating system.